I’m just discovering nettles after a friend left me a large bag of the leaves after she went wild-crafting, and also reading about nettles from Learning Herbs (1). 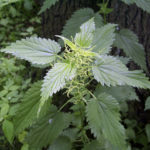 I’ve known for a long time that nettles offer excellent nutritional profile, and a tea made from blanching the leaves can be very helpful to relieve symptoms of hay fever and other pollen allergies. 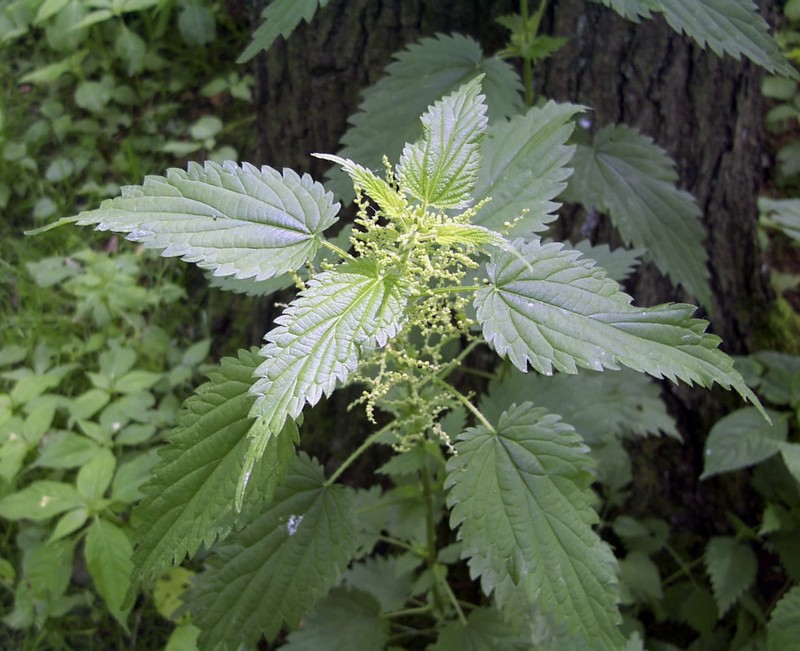 See the section on Nettles in my article: Herbs and Spices, G – Z, for more; see also Earth Shake: Nettle Smoothie (3). I just blanched that bag of nettles and saved the blanching water to drink as tea and use for nettle soup. My friend steered me to this recipe from River Cottage (2), which I’ve adapted, below. This recipe is adjusted (serving size) and adapted from River Cottage (2), an English cooking school with an emphasis on sustainability. The original serves 4; I’ve adapted for 2 servings. It cites ‘a carrier bag-full’ as the amount of nettles. A carrier bag is a large paper, cloth or plastic bag used for grocery shopping. This holds a lot of fresh nettles, but they coo down to a smaller amount. Prep: Wearing rubber gloves, sort through the nettles, discarding anything you don’t like the look of and any thick stalks (I save the very tops, then remove and save the other leaves from the stalk, and compost the stalks and any undesirable leaves). Wash the nettles and drain in a colander, reserving the cooking water as a veggie broth or nettle tea. Chop onion; peel and cube the potatoes and carrots. Soup: Melt butter in a large saucepan, add the onion and cook gently for 5-7 minutes until softened. Add the broth/stock, nettles, potato and carrot. Bring to a simmer and cook gently until the potato is soft, about 15 minutes. Remove from heat. Using an immersion blender (electric hand-held stick blender), purée soup and then season with salt and pepper to taste. Serve: Ladle into warmed bowls and float a teaspoonful of crème fraîche/sour cream on top. As this melts, swirl in a few drops of extra-virgin olive oil and Tabasco. This entry was posted in Fat or oil, Herbs, Leafy Veggie, Onion family, Root Veggie, Simmered, Spices, Stock, broth and tagged broth, butter, carrot, nettles, olive oil, onion, potato, sour cream, stock, tabasco. Bookmark the permalink.